Mark your calendars for Family Weekend, September 28th - 30th! The Rowan University Office of Parent and Family Connections Program provides comprehensive resources and programs for parents that are designed to enhance their understanding of the university experience, support student success, and promote an appropriate role for parents and family members within the university community. Through university-wide collaboration, the Parent and Family Connections Program endeavors to support parents in fostering their student’s growth and development within the context of the overall mission of both the Division of Student Life and the University. 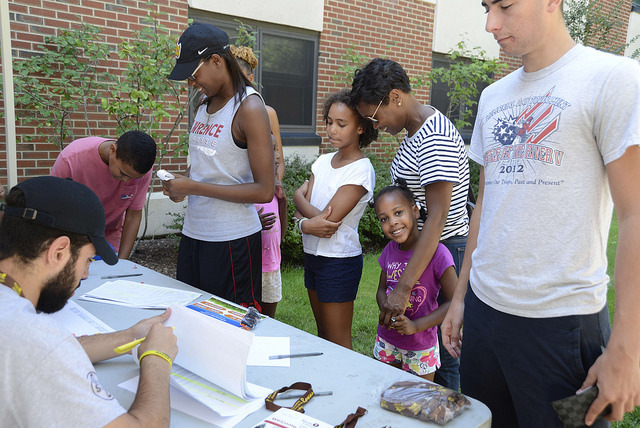 Rowan University’s First Generation Support program's Flying First initiative was developed to help enhance academic success for our first-generation students while focusing on an increased sense of belonging within our campus community. Through the promotion of diversity, educational opportunities, and intentional support, Flying First hopes to aid with the transition to college, provide resources to facilitate success in the classroom, and foster pride in and positive perceptions of first-generation students through networking and advocacy throughout the University community. To learn more about the Flying First initiative, click here. Stay informed and involved by subscribing to our Parents Connection email group. We will email you a monthly newsletter and important information about university initiatives and developments. To join the Parents Connections Email Group, click here! To unsubscribe from the email service, click here. The Parent and Family Connections Program is located in Suite 203 of Savitz Hall. Office hours are 8:30 a.m. - 4:30 p.m., Monday through Friday, excluding University holidays. Check out our 2019 Parent & Family Connections Handbook!